Get a good bench grinder. It doesn’t have to be in the way – you can make a stand for it and keep it in the corner. 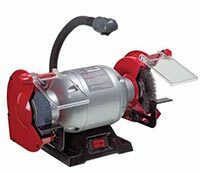 But you’ll be amazed at how much you’ll use a bench grinder. You’ve got to keep all of your chisels sharp and keep the burrs off of your screwdrivers, too. A grinder doesn’t cost that much, and the time and expense it saves you when you have dull tools will pay for itself in no time. All of your saws will have options on how many teeth-per-inch, or TPI you use. To make your decision, you need to know what you are striving for with a cut. A saw blade with a lot of teeth will make smoother cuts. However, you run the risk of burning your wood. This is because a fine-toothed saw moves more slowly through the stock. It also doesn’t clear the sawdust out of the cut as quickly, since the gaps between the teeth are smaller. These gaps are called gullets, and on fine-toothed saws, numerous small gullets hold more sawdust than the bigger gullets on a wide-toothed saw. The wide-toothed saws will aggressively buzz through your stock with less burning, but the cut will be rougher, probably requiring refinement with your orbital sander or jointer. As a general rule of thumb, you should keep a selection of blades for your saws. 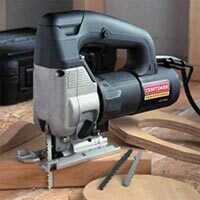 Your circular saw and table saw, as well, can make rough cuts with a 40-tooth saw blade. Plywood and other laminated materials will work well with an 80-tooth saw blade. If you know that the blades of your saws are right, but are still having trouble getting the cut you want, the moisture content of your stock may be wrong. Wood that has a moisture content level that is too high for your area will “feather” when it’s cut, regardless of the size or sharpness of the blades. Wood that is too dry will crack and split when you cut it. If it seems that no matter what you do to your saws, you still don’t get satisfactory cuts, use your moisture meter to check the moisture content levels of your stock. The next power tool you should purchase is a power drill. Now, many people swear by cordless drills, but they’re more expensive, and they can’t do everything that an electric drill can do – that’s where the term “power” comes in. 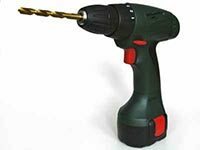 Power drills are not as expensive, and they’re more powerful than cordless drills, which do have their place in your shop. The steady power that comes with a corded drill makes it a better tool for extended use, especially when using large bits such as paddle bits. 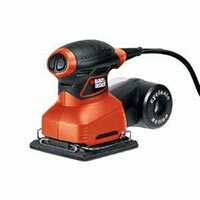 A random orbital sander is actually a step up from the “little brother” version – the palm sander. 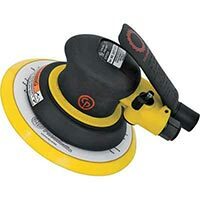 The random orbital sander uses hook and loop (Velcro) to fasten the sanding disks to the sanding pad. The random movement of the disk helps to avoid sanding patterns into your wood. Your main precaution with this tool is to make sure that your hardware supply store has discs in stock in every grit. Otherwise, you’ll have a sander that you can’t use because you can’t find sanding pads for it. Now, we start getting into the first permanent fixture in your woodworking shop – the table saw. Of course, table saws can be loaded in the bed of your truck, so, technically, they’re portable. But, the table saw is not one you can pick up with one hand and head to the worksite. The table saw will be the workhorse of your shop, so get a good one. 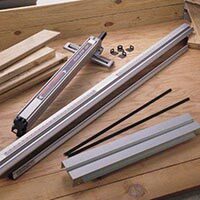 You’ll use it to rip, miter, shape, square, groove, and join, so a good saw that suits your needs is vital. The work surface should be heavy duty to withstand the abuse it will take. Look for a handle to raise and lower the saw blade easily. It should have another handle so that you can adjust the angle of the blade. See if there are connections for a dust collector, too, to make that aspect easier. You’ll want your table saw to have enough power to cut through hardwood and make deep cuts. Again, look at amps and horsepower. The motor should start with little to no vibration and run smoothly. Make sure it has a blade guard and that the on/off switch is easy to reach. These days, the power switch is a paddle that is easily pressed with your knee if you need an emergency off. As pitch from the wood you cut accumulates on your saw blades, you’ll need to pause and take the time to clean them off. The pitch will heat up as you use the blade, and overheat the blade, damaging it. 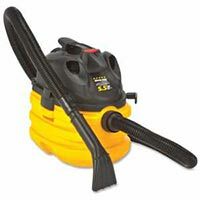 There are a number of commercial cleaners available, but you can just soak them in oven cleaner. This will dissolve the pitch, with only a little rubbing. Do not use any abrasives on your saw blades. Scrubbing cleansers and rough pads will leave scratches on the blade, which will only hold more pitch, making the problem worse the next time you need to clean the blade. 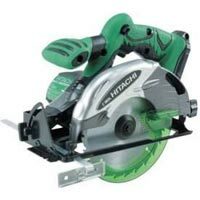 All saw blades dull over time, but your circular saw and table saw blades can be resharpened if they are carbide. Since carbide blades are more expensive, this feature makes the blade more cost-effective, since sharpening will prolong the life of the blade. Your table saw should have a rip fence. You’ll want one with a fine-tuning adjustment that runs parallel to the blade. Some rip fences have an adjustment knob on each end of the fence, others on just one end. The main thing to look for is torque. When you move the fence, do both ends move evenly, or does the far end hand up? This can be a real problem, and you’ll save yourself a lot of frustration and stock lumber if you have a rip fence that stays parallel to the cutting blade. Look for a T-groove miter gauge on your table saw. While most saws have a built-in miter gauge, it may move out of the groove when you’re making your cuts. The gauge needs to slide smoothly in its grooves without being loose. If there was a 41 I believe it would be the reciprocating saw. There are a lot of nice attachments available such as the Flush Cut Adapter by Paws Off Tools to name just one. 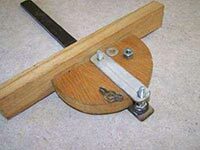 Wow, I think this is a great list for woodworking tools. These tips are useful for me. Because I have a new woodworking shop. I am so happy for your list. But one more thing, Do you have any woodworking safety information? Thanks for the feedback, Emil. We don’t offer any articles on woodworking safety information but we’ll consider it as a suggestion for future posts. Amazing Content About Woodworking Tools. Thanks you so much! You have covered an important part of woodworking. Woodworkers will be so much informed from your stuff. Great Stuff!